Linda Lee Sutton Original Doll Artist with some of her Creations. 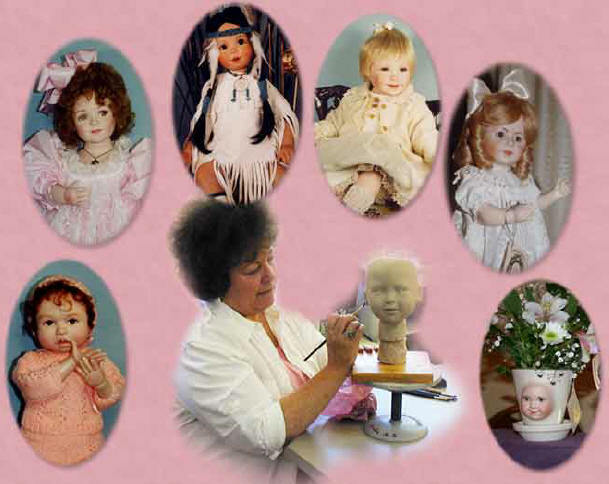 I specialize in creating and restoring beautiful, original porcelain dolls. By combining sculptural artistry and delicate, painted details, I revitalize collectable dolls and give new, authentic detail to these beloved characters. Each doll is a one-of-a-kind work reflecting exquisite life, innocence and exemplary workmanship. Collectable dolls have portrayed youth and elegance for centuries. Master craftsmen have created impeccable portrayals from porcelain, cernit, fabric and glass that continue to enthrall collectors. Have your original doll made with the same fantastic detail as the antique favorites, or even have a doll created in your child’s likeness. I use expert creative technique in antique reproductions and authentic elements in Native American dolls, limited edition dolls and portrait dolls. Indian dolls cloths and costumes use real beading and baby boards made by Native American artisans and antique reproductions showcase telltale styles used by classic artists. I make the Indian costumes of skins and use the beaded pieces and baby boards made by Native American Indians. Browse the gallery to see the collectable porcelain dolls for sale from artist and sculptor Linda Lee Sutton. Call or email for more information on doll repairs and unique collectables.